This is the most basic of all uses for mackerel. Please note that sharp knifes must be used at all times when preparing bait. Caution therefore required especially if fishing in a lumpy sea. 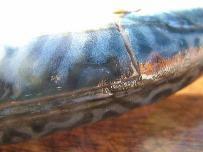 To start simply cut the fillet cleanly from the mackerel body. 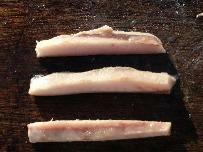 The example above shows a clean fillet taken from a frozen mackerel. 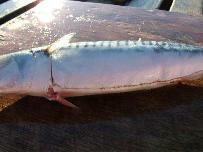 Small strips or segments can then be cut from the mackerel fillet as above. A small strip can then be mounted on to your hook similar to that pictured below. Most important when using all baits, but especially mackerel is to ensure that the hook point is proud and not hidden away in the bait. 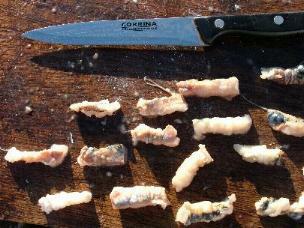 Baits can be cut to suit hook sizes, for this example hooks can vary from size 6 up to 2/0. 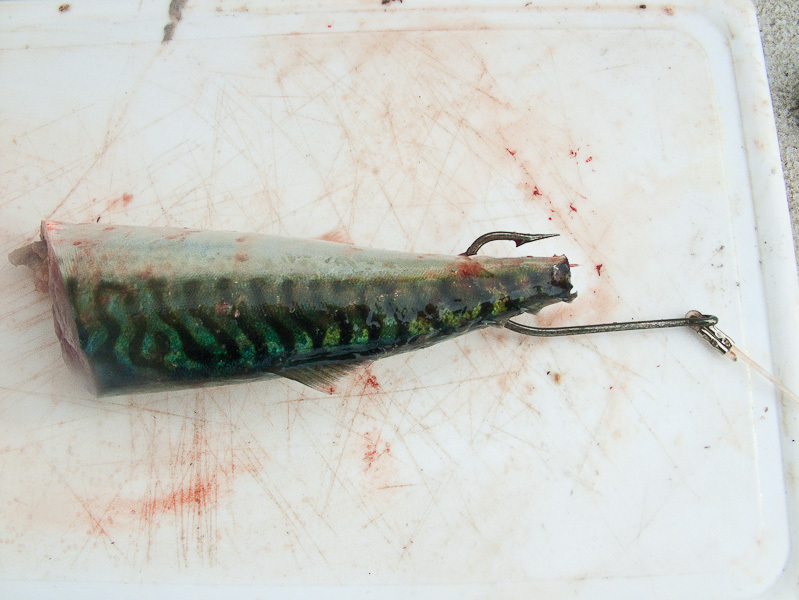 For larger fish and small shark half a mackerel fillet can be used on a larger hook. 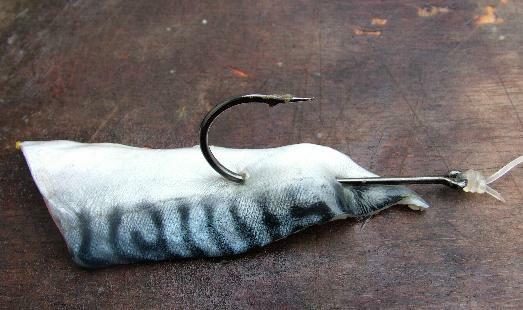 The example shown above is a Sakuma Manta 4/0 hook and half a fillet. 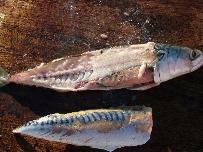 Mackerel can often be used similar to squid for tipping to another bait. The example shown below is ragworm threaded up a size 2 Sakuma Phantom hook and tipped off using a small strip of mackerel. 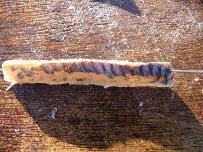 The mackerel sausage is a fairly new way to prepare mackerel. I was introduced to this by fellow WFSA team members who had witnessed some of the Mediterranean teams preparing their baits in this way during the 2004 World Championships in Portugal. The mackerel sausage allows the flesh to very slowly break from the main wrap, sending both scent and particles out, thus enticing the fish to you. It certainly works, and is well worth the effort when the fishing is slow or especially when in a match and trying to tempt as many fish to your hooks as possible. 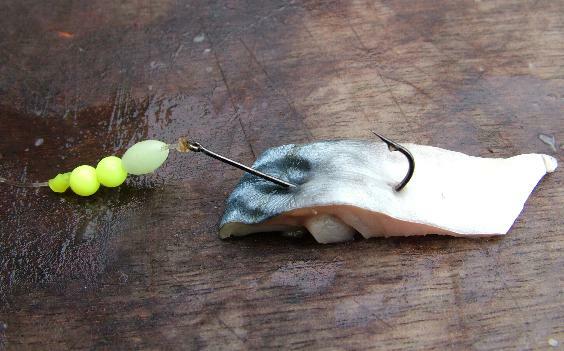 This bait style can be used with both fresh and frozen mackerel. It can be a good choice if the frozen mackerel has turned a little mushy, and is difficult to keep together or on the hook. If using frozen ensure the fish has defrosted first. Firstly you need to score the mackerel around each fillet. making a small incision run the knife blade around the fillet body on each side of the fish. The picture on the right help to demonstrate what is required. Starting at the ‘shoulder’ of the fish, you can then grab the skin firmly and pull it away from the flesh. Once you have removed the skin, you can then cut the fillet from the body. From each fillet, you should be able to cut three lengths of flesh of equal width, this is approximately 10mm in width. Now thread one section onto your baiting needle. 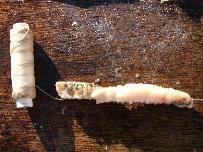 Using bait elastic, now you must wrap the elastic around the mackerel flesh. Varying the amount of thread used and strength in the wrap as you desire. 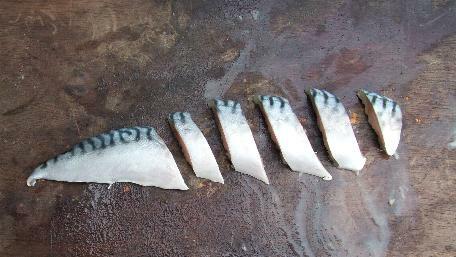 You can then cut the finished wraps of mackerel up into the desired sizes to thread on your hooks. When fishing for a variety of big creatures such as tope, huss, spurs and conger half a mackerel is normally the way forward. 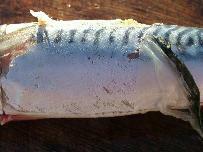 Where as some ports will prefer whole or mackerel flapper, I often find half a mackerel, mounted 1 of 3 ways on a good sized hook between 5/0 and 8/0 usually does the trick. 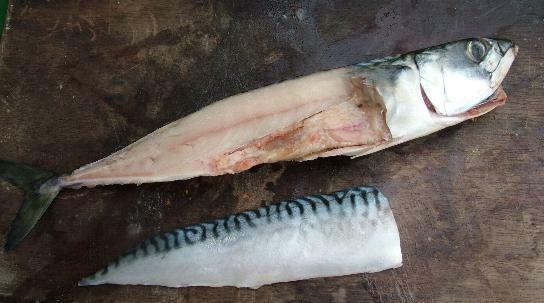 Above is the more commonly prepared half a mackerel. Cut half way through the body, with the hook passed through the lower jaw and out between the eyes of the fish. The bait is full of blood and half the guts – thus oozing scent for your prey. 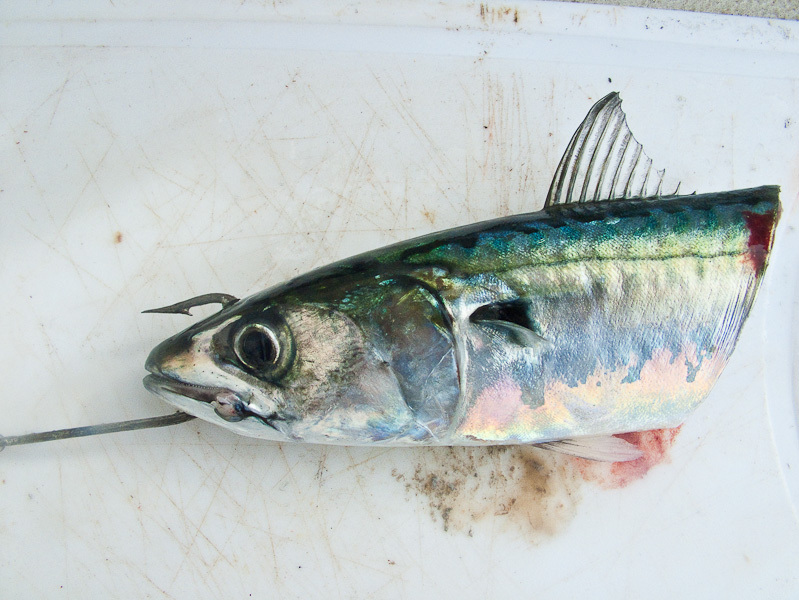 Above is a slightly different way of preparing the head part of a half mackerel bait. 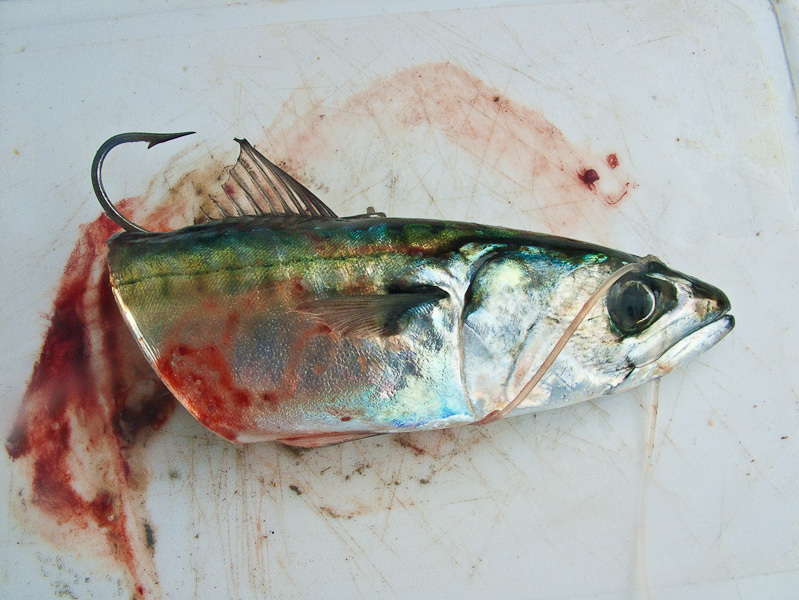 If you pass the hook through the jaw of the mackerel and out of the head, you can then wrap the line around the body, then digging the hook into the top body, use the loop created in the line to hold the hook proud. For the tail section, simply hook through the small part of the ‘cone’ shape. Sometimes I’ll add a little piece of bait elastic to ensure that the mackerel is tight on the hook. 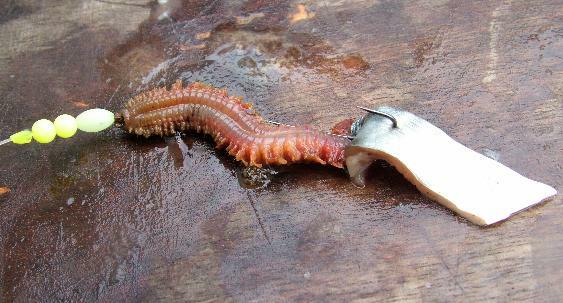 When fishing baits like this, it is fair to say that your targets are big and more than likely have a good set of sharp teeth on them; therefore it is best to use heavy monofilament of at least 100lb. Having seen many tope and spurs etc lost to inferior and low strength line, my recommendation would be good quality & supple 150lb mono.